"Slowly one stitches old cloth. Slowly one travels the path. And slowly one climbs to the top of the mountain." Throughout India and Eastern Asia, women are working individually and cooperatively to better their lives, one stitch at a time, creating beautiful throws from vintage cloth saris known as Vintage Kantha throws. Bright, bold and beautiful, these throws not only brighten interior décor and add beauty to your home, they also enrich lives, giving the Indian women who make them a means to support their families through their own entrepreneurship. With hundreds to choose from daily, each handmade vintage Kantha throw by the Kantha Collection is reversible and 100% original, allowing you to choose your favorite like a piece of art to collect and treasure. Kantha is one of the oldest forms of embroidery that originated in India. Its origins can be traced back to the ancient pre Vedic ages, however, Kantha embroidery as we know it today was found in Krishnadas Kaviraj's 500 year old book, Chaitanya Charitamrita. Rural housewives in West Bengal played a significant part in the evolution of Kantha embroidery. It was customary for these women to make use of Kantha's widely used running stitch and embroidery techniques to create quilts for their families, as well as embroider personal fabrics and garments such as sarees, dhotis and handkerchiefs with simple running stitches along the edges. For centuries, the techniques of the hereditary craft were, and still are, passed down from mother to daughter. Though it continued to be practiced amongst rural women, recognition of the craft was revived by Shamlu Dudeja in the 1980s when she founded Self Help Enterprise (SHE) that helped empower women and their livelihood through Kantha embroidery. 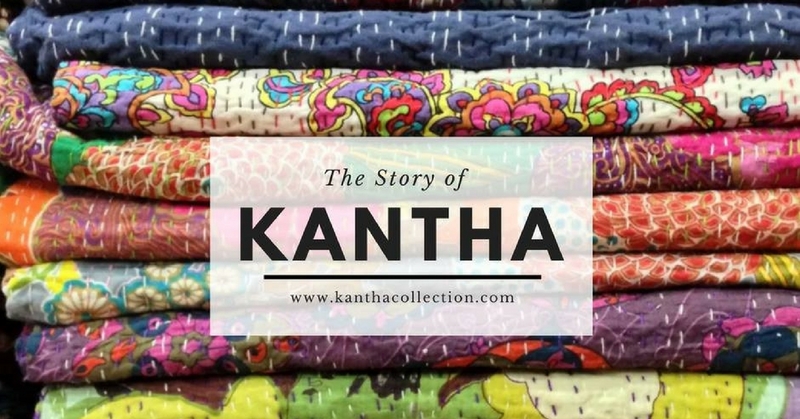 Kantha" is the Sanskrit word for rags, and old cloth was believed to provide protection from harm. According to the Quilts of India by Patrick J. Finn, a Sanskrit proverb-"Slowly one stitches rags, slowly one traverses the path, and slowly one climbs to the top of the mountain"-connects the craft to the deities Chindadeo and Chindadevi, the Lord and Lady of Tatters. Kantha is a form of embroidery, sometimes used to depict symbols of nature like the sun or the tree of life. Although a running stitch is most familiar in today's imports, women also created patterns that told family stories-as did African and early American quilters. Sometimes several generations of women would work on the same heirloom quilt. Both sides of a Kantha quilt are equally decorative but not identical. Kantha cloth is often made into tablecloths, pillow covers, scarves, and bags, as well as quilts. Authentic Kantha throws are handmade and will vary in size, color, and pattern.